In this artist's conception, a protoplanetary disk of gas and dust (red) is being shredded by the powerful gravitational tides of our galaxy's central black hole. Image released September 11, 2012. Astronomers have found a cloud of gas and dust around a young star being devoured by the giant black hole at the heart of our Milky Way galaxy, a find that, scientists say, suggests planets can form in galactic cores, scientists say. The supermassive black hole thought to lurk at the center of the Milky Way is named Sagittarius A*. Scientists estimate it is about 4.3 million times the mass of the sun. For the most part, very little light is seen emerging from near Sagittarius A*, aside from radio waves and some modest X-ray or infrared flares, suggesting not much matter is currently getting fed into it. This absence of data limits what investigators can deduce about the black hole's properties and behavior, as well as those of the other supermassive black holes believed to be at the centers of all large galaxies. Recently, astronomers gazing at Sagittarius A* through the Very Large Telescope in Chile spotteda dusty gas cloud three times the mass of Earth hurtling toward the center of the galaxy at more than 5.2 million mph (8.4 million kph). Scientists are monitoring this mysterious cloud's behavior as it moves closer toward the black hole's accretion zone — the region where matter begins its death spiral into the black hole. A new theoretical model now suggests the cloud is probably the shredded remains of a protoplanetary disk surrounding a young, low-mass star — the kind of structures that worlds eventually develop from. The star apparently came from the inner edge of a ring of stars 4 million to 8 million years old circling Sagittarius A* from a distance of about one-tenth of a light-year. Interactions within this ring could have flung this star, which by itself is too small for astronomers to see directly, toward the black hole on an elliptical, oval-shaped orbit. The center of the Milky Way might ordinarily seem like an inhospitable place to try to form a planet, since the young, massive, super-hot stars that often dwell there typically explode as supernovas, blasting out shock waves and bathing the region with intense radiation. 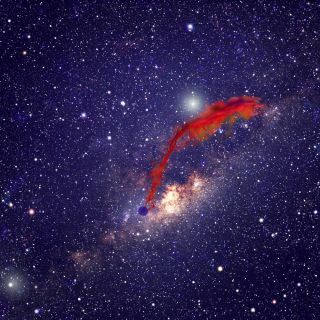 "The galactic center is one of the most extreme environments in the galaxy," said lead study author Ruth Murray-Clay, a theoretical astrophysicist at the Harvard-Smithsonian Center for Astrophysics in Cambridge, Mass. Nevertheless, the existence of protoplanetary disks near the center of the galaxy suggests that worlds can form in this cosmic maelstrom, as well as comets and asteroids. "If our explanation for the gas cloud we see is shown to be true, that means protoplanetary disks — and by extension, planets — can be found everywhere," Murray-Clay told SPACE.com. "It's fascinating to think about planets forming so close to a black hole," study author Abraham Loeb, a theoretical astrophysicist at the Harvard-Smithsonian Center for Astrophysics in Cambridge, Mass., told SPACE.com. "If our civilization inhabited such a planet, we could have tested Einstein's theory of gravity much better, and we could have harvested clean energy from throwing our waste into the black hole." Future research might look for evidence of planets, comets and asteroids falling into supermassive black holes in other galaxies, such as the bright flares dying worlds would release as they get ripped apart. The glowing remains of protoplanetary disks getting sucked into black holes could shed light on low-mass stars near galactic cores that are otherwise too faint to be detected. As the star continues its plunge over the next year, more and more of the disk's outer material will get torn away. The stripped gas will swirl into the maw of the black hole, and friction will heat it to incandescence, causing it to glow in X-rays. "We're really looking forward to next summer," Loeb said. Murray-Clay and Loeb detailed their findings online today (Sept. 11) in the journal Nature Communications. You can follow SPACE.com on Twitter @Spacedotcom. We're also on Facebook & Google+.